David Bend, Neil Fortey, Phil Harding, DSue Harding, Val Lever, Vic Martin, David Middleton, Sue Middleton, Kathleen Panter, Kate Pugh, Ken Roberts, Dave Slater, Joyce Slater, Bob Sparham, Will Wiseman. Website and catalogue – in process – Community sites to be liaised with over migration to new software. • Who served – service list – your family? 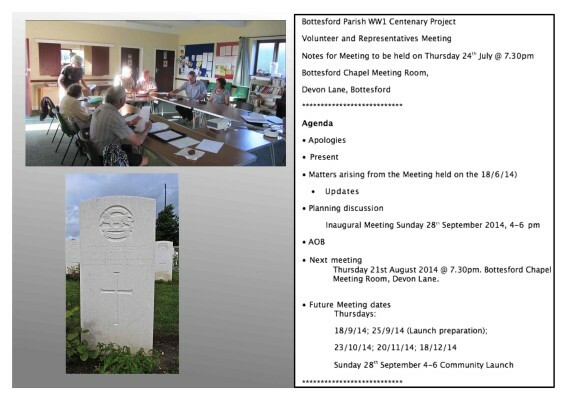 • Who did not return – war memorials – photographs and brief details? • Researching your family in the 1st World War – your stories? • WW1 memorabilia – your memorabilia – examples? • What happened on the home front in the Parish – Grantham Journal reports? • How you can join in – volunteer recruitment? This page was added on 06/08/2014.